Extreme temperatures can’t slow down the professionals at South Industries. 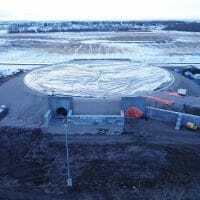 In the winter of 2017-2018, they took on the challenge of building a frac sand storage dome in Grand Prairie, Alberta Canada. Even with temperatures fluctuating between -40°F (-40°C) and 45°F (7°C), work was able to carry on. A significant roadblock for traditional construction, these temperatures only provided a slight delay for South Industries. After taking advantage of the relatively warm temperature of 45°F (7°C) to connect the Airform membrane to the footing, the team was forced to wait out the wind. It wasn’t until 8:50 p.m. that the winds died down enough to partially inflate the dome. Once the Airform retained enough pressure, the crew waited until first light for final adjustments. 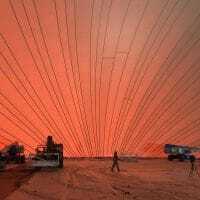 They returned bright and early the next day to lay down plastic inside the Airform and complete inflation. These are no nine to five workers! Just a few days later, the first layer of foam was applied, and the dome could be heated for remaining work. Vital equipment such as the airlock and concrete pump were protected by a heated outbuilding. Work continued without delay, even when the temperature dropped to -40°F (-40°C). 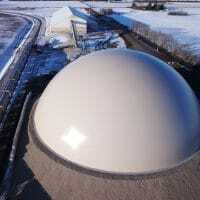 When asked about the weather conditions, General Manager of South Industries Andrew South responded, “We can build domes in extreme temperatures.” He continued, “We have the skills and expertise to handle those conditions.” He finished by relating that the entire structure, including sub-grade tunnels and foundation, was completed in just 14 weeks. Do you have a project in a location with extreme temperatures? Are dedication and speed important to your project and bottom line? The professionals at South Industries have the experience and expertise to help you.